Artist's concept of NASA's MESSENGER spacecraft in orbit around Mercury. MESSENGER is due to end its mission with a plunge onto the planet's surface on April 30, 2015. The first spacecraft ever to orbit Mercury will crash into the solar system's innermost planet two weeks from now. 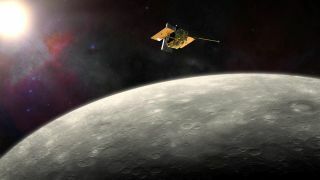 NASA's MESSENGER probe, which has been circling Mercury since March 2011, is nearly out of fuel and will say goodbye with a dramatic death plunge on April 30, provided that one final orbit-raising maneuver scheduled for April 24 goes as planned, mission team members said. "That impact will not be in view," he added. "It will happen during a planetary occultation, so the spacecraft will pass behind the planet, out of view of the Earth, and will just not emerge again." MESSENGER, which is about 10 feet (3 meters) wide, will slam into Mercury's surface at 8,750 mph (14,080 km/h), generating a crater about 52 feet (16 m) across, O'Shaughnessy said. The impact should occur at about 54 degrees north latitude. Mercury is covered by craters, but the one MESSENGER creates on April 30 will be of particular scientific interest, said Sean Solomon, the mission's principal investigator and director of Columbia University's Lamont-Doherty Earth Observatory. MESSENGER's grave could help researchers better understand Mercury's rates of space weathering, which tends to turn bright, freshly exposed materials dark, Solomon said. "Having an impact crater, even a small one, whose origin date is precisely known, will be an important benchmark," he said. Ground-based instruments will not be able to study or monitor the MESSENGER crater, but the BepiColombo Mercury probe — a joint European-Japanese effort due to launch in 2017 and arrive in orbit around the planet in 2024 — very well could. The BepiColombo team "will be looking for signs of this crater, and if they can make measurements of it, they will know precisely how long that region has been exposed to space," Solomon said. "That will be an important study that comes a decade from now," he added. MESSENGER has achieved a great deal during its time at Mercury. For example, the probe's observations have helped scientists construct the best-ever maps of the planet, and MESSENGER confirmed that carbon-containing organic compounds and water ice exist inside the permanently shadowed craters near Mercury's poles. Comet and asteroid impacts probably delivered the water and organics from the outer solar system to Mercury — and to the other rocky planets close to the sun, including Earth, mission scientists said. "For the first time in history, we now have real knowledge about the planet Mercury that shows it to be a fascinating world as part of our diverse solar system," John Grunsfeld, associate administrator for NASA's Science Mission Directorate, said in a statement. "While spacecraft operations will end, we are celebrating MESSENGER as more than a successful mission," he added. "It's the beginning of a longer journey to analyze the data that reveals all the scientific mysteries of Mercury."